Monadnock Speedway was definitely the place to be on Saturday night if you were in the Southwestern corner of New Hampshire. The True Value Modified Racing Series kicked off their season in front of a crowd that was standing room only (and five deep at that) in both the pit stands and the grandstands. And that was during the heat races. Things got even more crowded for the features. The fans seemed to know that it was going to be a full house. 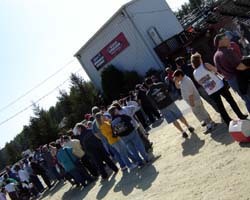 They were lined up through most of the parking lot 30 minutes before the ticket booth even opened. Heck, there were even a few refugees from the NASCAR Whelen Modified Tour in the house. Car owner Billy “Bear” Callichio was seen in the pits. Veteran promoter Ben Dodge was there. Long Island’s David Roys went from being Howie Brode’s crew chief last week at Thompson Speedway’s Icebreaker to wheeling the #79, a car driven on the short track last season by the late Tom Baldwin, to a top-10 finish. In the middle stages of the race, several drivers who might have had a fighting chance at Hinckley fell by the wayside. Jim Boniface coasted to a stop in turn one around halfway. Kuhn cut a tire while running third. 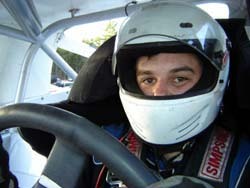 Andy Seuss lost the belt to his oil pump while in fourth place. On the final lap, Kirk Alexander pulled up alongside of Hinckley on the backstretch to look for the lead and that was as close as anyone got to Hinkley’s #06 all night long. that was after 10pm and numbing weather that dropped close to the freezing mark when the sun went down, most of the fans stayed for the entire night. When it was finished, they were cold, but happy. But when all was said and done, nobody left the track any happier than Les Hinckley, who routed the field with a convincing victory. Once Hinckley got into the lead by making a bold pass on the outside of Jimmy Kuhn a quarter of the way through the race, he never looked back. After the race was over, and the clock approached midnight, Hinckley still had another race to run before his day was over. But that involved leaving the track. 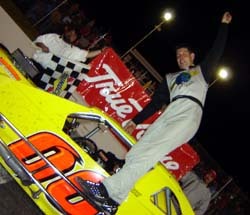 The next race for the True Value Modified Racing Series will be May 1st at Lee USA Speedway. have mattered. In post race technical inspection, Alexander’s #43 was disqualified for having a carburetor that was not up to spec. 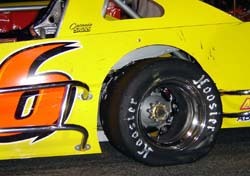 Another post race discovery had to do with the left rear tire on Hinkley’s #06. As the car sat in victory lane, air was leaking right out of it and had the race lasted much longer, Hinckley would have been out of contention. Hinckley' celebrates in victory lane.